Overview - Submerge yourself into the Blue Realm! This natural history television series is about amazing creatures of the sea. Utilizing superb High-Definition imagery, engaging stories, and leading marine scientists the series takes viewers on extraordinary journeys of discovery! Danny Mauro has developed and filmed over 100 programs about the marine environment. He began production of his first High-Definition series in 2003, The Blue Realm. The eight-part series began airing in 2004 on Discovery HD Theater, Discovery Canada, Discovery International HD and National Geographic International. 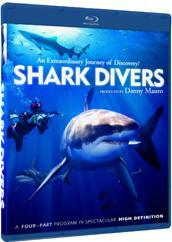 CONTENTS: The Shark Divers - Sharks are BIG business in adrenaline eco-tourism. And some thrill seekers deliberately pursue close encounters with deadly sharks - without the protection of a cage. The bigger and more dangerous the shark, the better. But have we taken this risky sport too far? Shark Business - Shark Business unravels some of the mysteries surrounding sharks with controversial behaviorist Dr. Erich Ritter. You'll witness divers testing the limits of shark-human interaction outside of cages with dangerous sharks such as lemon, bull and even Great White sharks! Whale Sharks: Gentle Giants - Whale Sharks: Gentle Giants introduces us to this amazing creature through scientists who are racing against time to save the species. Utilizing space-age technology from NASA and the Hubble Telescope, researchers are able to identify, catalogue and track individual sharks. Giants of San Benedicto - You?ll travel to the remote Socorro Islands off Mexico's Pacific coast and see breath-taking encounters with enormous manta rays. You're sure to love these majestic giants as you see how they invite human contact, and encourage certain divers to ride them. The film crew also travels to the Bahamas to visit "Bubbles", a fifteen foot Manta in the world's largest aquarium, and witness her release back into the ocean. Are you once again terrified to go back in the water after watching the recently released 'Jaws' Blu-ray? Do you now think all sharks are blood thirsty, man-eating killing machines out to devour your young? Well then, look no further than 'Shark Divers' to help mitigate those fears. Part PR damage control for the predatory fishes, and part educational documentary, the program is sure to dispel many unfounded, negative assumptions about the deadly sea creatures. Separated into four episodes focused on different aspects of sharks and shark tourism, the programs might get you back in the water, and could even inspire you take a swim with the sharks yourself… maybe. Err, probably not. After all, did you see what that thing did to Quint?! Did you?! The first episode, titled 'Shark Divers,' takes us to Mexico and the Bahamas, giving us an intimate look at various shark diving trips. A narrator guides us along, feeding various facts and statistics as we're treated to lots of underwater footage of the divers interacting with the sharks. As surprisingly benign as they seem, one particularly "hairy" moment involves a curious shark almost taking a bite out of one diver's air tank (apparently they like to "investigate" things with their mouths). Great Whites are highlighted, and the show reveals various bait tactics used to lure the animals toward the willing divers. There's even a trip specifically designed for little kids, where the brave children are lowered into shark proof cages. While that might sound like some kind of creative and elaborate new form of scare-tactic punishment ("Timmy, if you hit your sister again, you're going back in the shark cage! "), I assure you, they are very eager participants. The impressive Georgia Aquarium is also spotlighted, and there are additional interviews with various shark researchers, divers, and shark attack survivors. Episode two, 'Shark Business,' takes us to the Cape of Good Hope, Hornby Island, and back to the Bahamas for more shark related fun. The ins and outs of shark tourism are discussed along with more underwater footage and details on shark behavior. The infamous shark feeding-frenzy is also analyzed and a shark attack forensics investigator is spotlighted (you know, like 'CSI' but for sharks). As we learn, it turns out most shark attacks are actually just "misunderstandings." We also get a rare look at the interesting sixgill shark, and are treated to a tour of the Atlantis Resort and its sea life. The third episode, 'Gentle Giants,' focuses on the massive but placid whale sharks, and features locations in Mexico and Australia. More shark watching and swimming trips are documented, offering yet more footage of people interacting with the giant fishes. Whale shark behavior is analyzed and details are given on how computers are being used to help identify individual sharks based on their unique spots. We also return to the Georgia Aquarium for some aquarium diving. The final installment, 'Giants of San Benedicto,' shakes things up a bit, switching gears from sharks to a close relative, the manta ray. The rays close relationship to sharks is detailed along with lots of information about their biology and intelligent behavior (in an alternately creepy yet fascinating tidbit, they seem to be able to recognize human beings based solely on their eyes). The strange relationship between remoras (also known as suckerfish) and rays is discussed, as the former is always shown to be latched onto the latter (turns out they’re just bumming a ride). We also return to Atlantis, where their own captured manta rays are spotlighted. As a whole, the show actually offers a solid amount of shark facts, trivia, and decent underwater footage that shows off the sea creatures in their natural habitat. Unfortunately, the program can also be quite redundant, often covering a lot of the same ground throughout the different episodes. Likewise, there is a sometimes calculated effort made to endorse shark tourism and many of the experts' rationale for supporting shark diving tours and aquariums is a little shaky. The presentation of the material can also be a bit problematic, with a slightly "extreme," in your face quality to the editing and score that attempts to dress up the otherwise basic content with empty flash. Thankfully, this style isn't too obtrusive, and the last episode mellows out considerably. Mill Creek Entertainment brings 'Shark Divers' to Blu-ray on a BD-50 disc that comes packaged in a keepcase. After some logos and warnings, the disc transitions to a standard menu. The packaging indicates that the release is region A compatible. The program is provided with a 1080i/AVC MPEG-4 transfer in the 1.78:1 aspect ratio. While there are some artifacts here and there, this is a decent video presentation that offers some cool underwater footage. The digital source is fairly clean but noise does crop up from time to time. Likewise, banding is also visible in certain shots. While the vast majority of the footage is taken from high definition sources, there are a few clips culled from standard definition material, and these segments look understandably lackluster. Clarity in the HD footage is decent, but the image lacks fine detail and is predominantly flat. Colors are bright and nicely saturated in outdoor scenes, but a lot of the underwater material has an expectedly washed out appearance. Contrast is quite hot, leading to a slightly blown out look in some scenes but blacks are consistent. While a lot of the underwater footage can look hazy and murky, there are also many great shots that capture the sharks and rays in all their glory. 'Shark Divers' isn't a particularly great looking effort, but despite a few artifacts, the underwater footage is pretty interesting. It can't compare to other higher budget nature productions, but it looks fine for what it is. The audio is presented in a series of English DTS-HD MA 2.0 tracks. No subtitles are included. Basic and generic, this is an average mix that does little to enhance the visuals. Dialogue and narration are clean and well balanced throughout. Notable directionality across the two channels of audio is rare, and while there is some stereo separation for the program's music, it's never very noteworthy. Speaking of the music, the soundtrack is actually kind of annoying and the generic instrumental rock score can be overbearing. Dynamic range is fairly flat but there is no distortion among the highs or lows. Bass activity is negligible, but the music does carry a slight kick. The audio is serviceable but little else. There are no major problems to speak of, but the mix does absolutely nothing to bolster the images and the annoying music can actually detract from the experience. Shark fans, you're out of luck, as there are absolutely no extras here. 'Shark Divers' offers a decent assortment of shark related programming that provides some educational facts and solid underwater footage. It's not particularly engaging, but those looking to learn more about the potentially deadly sea creatures might want to take a look. The video and audio are both pretty basic, and while far from impressive, they get the job done just fine. With no special features, this isn't a very enticing release, but some might find the material worthwhile. For fans only.